If we were running a good radio station these days, we of course still would have The Midnight Tracker spinning one side of a new record each night at midnight, as they did back in the ’70s. This week, one such record could be “Dennis Coffey,” the self-titled LP from Detroit funk and soul guitar legend Dennis Coffey. It came out earlier this week on Strut Records. He still can bring it. Stoked though we are about this great new record, we deal in vintage vinyl here. Tonight, we proudly bring you another fine side from Dennis Coffey, whom we last featured a while back. Coffey, a member of Motown’s great Funk Brothers rhythm section, burst onto the scene as a solo artist in 1971 with the scorching Top 5 instrumental single “Scorpio.” He followed it up the next year with “Taurus,” another sizzling instrumental that reached the Top 20. Tonight, we have that follow-up record. 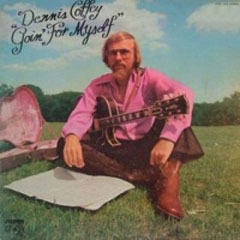 “Taurus,” “Can You Feel It,” “Never Can Say Goodbye,” “Ride, Sally, Ride” and “Midnight Blue,” Dennis Coffey, from “Goin’ For Myself,” 1972. It’s out of print. This is Side 1. It runs 15:52. “Taurus” kicks off a side full of Coffey originals, save for Coffey’s laid-back take on “Never Can Say Goodbye,” the Clifton Davis tune that the Jackson 5 made famous, and “Can You Feel It,” co-written with producer Mike Theodore. “Taurus” and “Ride, Sally, Ride” clearly are crafted along the same lines as “Scorpio.” They’re credited to Dennis Coffey and the Detroit Guitar Band, as is “Midnight Blue.” These cuts feature fellow Funk Brothers Bob Babbitt on bass, Andrew Smith on drums and Jack Ashford on percussion.